It is with the greatest sorrow that we announce the death of our dear colleague and friend, Ncedile Daki, senior Handspring puppet maker and co-founder, technical director and designer of Ukwanda Puppetry and Design Collective, formerly known as Masiphumelele Youth Development. Early last Sunday morning he was returning to his home after a party when he was cruelly gunned down and his car was stolen. Wounded, he ran from his attackers but he succumbed more or less immediately. Back in 2004 Nced was living in Masipumelele and attending art classes at the local library. He’d recently finished high school and Sue Alexander the founder of the library spotted his talent and introduced him to Handspring, which he joined in 2011. He started with very simple work, bending and binding cane for the horse puppets for War Horse. Initially he was quiet, self-deprecating and modest. But gradually he became more communicative and he began to reveal his other qualities: generosity, kindness and a sense of humour that was based on a real sweetness. His talent for puppet making began to grow rapidly. This was founded on Thys Stander’s mentorship, who taught good technique and a proper discipline as a creator. Nced kept notes on all he did at work and even under pressure, could be relied upon to meet deadlines. By the end of his first year at Handspring he was doing much more complex work. Nced joined the group of 21 Handspringers that went to London to see War Horse at the invitation of The National Theatre of Great Britain. He attended the opening of a special exhibition on the Making of War Horse to which he had contributed and enjoyed a standing ovation from the audience on the occasion of the group’s attendance at the show. In 2013, Nced toured with Janni Younge’s production Ouroboros travelling to Charleville-Mezieres, Brugges, Toulouse, Combs La Ville, Fontenay sous Bois, Mulhouse and Strasbourg and to India, where Nced stayed on, travelling alone through this exciting land – a real expression of his bravery and sense of adventure. In 2014 Ned was the logical choice as the backstage technician who cared for the horses when the UK production of War Horse toured to South Africa. This work was seen in CNN’s Inside Africa documentary and broadcast to 212 countries 300 million households and hotel rooms throughout the world. 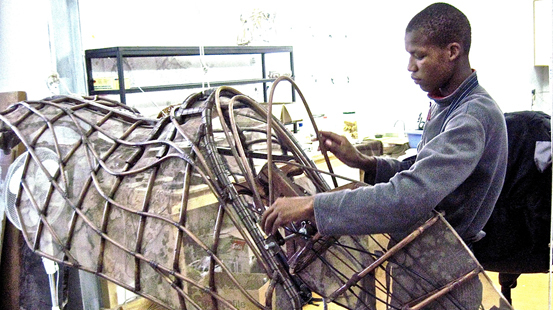 As work on War Horse puppet making was beginning to tail off, Ncedile and Luyanda, both employees at Handspring, began working with a group of youths in Masipumelele township near Cape Town. In 2010 they had formalized this group into Masiphumelele Youth Development and were joined by Sipho Ngzola and Siphokazi Mpofu. This quartet began writing a play and their first production, Qhawe, developed and directed by Mongi Mthombeni, went to the National Arts Festival and was the recipient of a Standard Bank Encore Ovation Award in 2015. 2016 was a great year for Nced in that he was the designer of Ukwanda’s giant Slyza Tsotsi pantsula dancing puppet that performed at the Cape Town Carnival, becoming a favourite of the crowds. People remember Llysa Tsotsi now as a kind of self-portrait of Nced. Also in 2016, Prof. Premesh Lalu, director of the Centre for Humanities Research and Chair of Handspring Trust, secured a grant through the Andrew W. Mellon Foundation and the DST/NRF Flagship on Critical Thought in African Humanities, which guaranteed financial support for Ukwanda going forward. Lalu also found premises at the CHR Factory of the Arts in the former District 6. This dovetailed with day-to-day support from Mongi Nthombeni, Melanie Roberts, and Khanyisile Mbongwa. These have been key factors in Ukwanda’s continuing success. Ncedile was born on 1 September 1990 at Cofimvaba Eastern Cape. He went to Isilimela Comprehensive School in Langa Cape Town. He is survived by his parents who reside in the Eastern Cape and by his five sisters: Noluvuyo, Cikizwa, Thandiwe, Fezeka and Ntombizodwa.